After more than a decade of operation, it seems that the role of the International Criminal Court (ICC) is still unknown to many. Indeed, while its creation gave rise to great expectations, today a number of lingering questions have sown seeds of doubt and skepticism about the court and its function. It is to address this concern that the International Center for Transitional Justice has just published The Handbook on Complementarity: An Introduction to the Role of National Courts and the ICC in Prosecuting International Crimes. From its introduction, this booklet plunges us into the difficult genesis of an international criminal justice system and the long gestation of the fight against impunity. It makes us relive the tensions that peppered the drafting of the Rome Statute, which created the ICC, and outlines the complexity of the ICC’s procedural rules. In a word, the booklet teaches us that, contrary to preconceived ideas, the ICC has neither the objective nor the means to replace national judicial institutions and that, in fact, its mission is to ceaselessly remind national courts of their obligation to prosecute serious crimes committed within their jurisdictions. Looking at the Democratic Republic of the Congo (DRC), the strong ties developed between DRC authorities and the ICC are exactly what enable the sharing of lessons learned from implementing this reciprocal relationship. In the DRC’s case, it was via a letter dated March 3, 2003 that the president requested the ICC’s assistance "on account of the specific situation" his country was in, wherein "the competent authorities were unfortunately not in a position to investigate the aforementioned crimes, nor to initiate the requisite criminal prosecutions without the ICC’s involvement." This alluded not to a lack of will on the part of the state to try serious crimes, but rather to the lack of the Congolese judicial system’s capacity to do so. Far from an admission of powerlessness, this courageous statement very quickly evolved into a source of positive energy. Parallel to the DRC’s commitment to cooperate with the ICC, notably realized by its handing-over several suspects, efforts were undertaken to strengthen the Congolese judicial system’s capacity, with the support of external partners. Less than one month after Thomas Lubanga was surrendered to the ICC, the Military Tribunal of the Garrison of Mbandaka, directly applying the provisions of the Rome Statute, rendered its verdict in a case involving crimes against humanity, better known as the Songo Mboyo Case. To appreciate the historic nature of this judgment, it must be remembered that despite the integration of international crimes in Congolese law, already found in the Code of Military Justice of September 25, 1972, the Songo Mboyo judgment was the very first of its kind. Today, to their credit, the Congolese military courts have rendered over 60 judicial decisions regarding crimes of international concern. This record is far from negligible, even while everyone agrees that the task remains immense. But let that not be discouraging: the critical analysis to which this jurisprudential production is subjected enables the daily improvement of the quality of legal decisions. The ICC has no police force; therefore, the cooperation of states is a functional necessity. “This is perhaps the biggest difference between it and national justice systems,” the handbook affirms. In other words, the ICC is obliged to lean on state parties (those states that have ratified the Rome Statute) to perform different motions for the assistance it receives. To better carry out this task, state parties must ensure that their national legislation provides for procedures that allow for all forms of cooperation with the ICC. One of the procedures is adopting a law that implements the Rome Statute. The standard procedure for returning detainee-witnesses to the DRC, which it enabled the return of four detainee-witnesses after their appearance in The Hague. This document, fiercely negotiated between the DRC and the Registry of the ICC, greatly facilitated the settlement of the legal mess born of the surprise asylum request submitted by the detainee-witnesses to the Dutch authorities. Their added value is that their provisions follow international standards regarding the right to a fair trial in such a way as to make all the ad hoc processes comply with the spirit and letter of the Rome Statute. Implicitly, they charted the course for future legislative reforms. This is not their least merit. Does Complementarity Obligate the ICC to Provide Assistance to State Parties? Because the ICC is unable to prosecute all the crimes within its jurisdiction (it currently has 124 states parties), it is in its interest to help strengthen the operational capacities of national courts, in any way that it can. In the DRC, there are several opportunities for the ICC’s contribution: training local investigators; advocacy and donor outreach; sharing with national judicial actors the data to which it is privy, as it pertains to cases investigated at the national level, etc. On this last point, there is reason to underline the powerful technological resources and specialized services at the disposal of the ICC for collecting and preserving evidence. In particular, the ICC has an extensive database that could benefit many national prosecutors and judges. The DRC, notably faced with a deficit in this area, cannot unfortunately help but express its frustration at having so little benefit from the ICC’s consideration, when it could reasonably expect a better fate. For states in post-conflict situations, it is therefore crucial to organize collaborative bridges between formal state structures and reliable non-state actors in order to capitalize on the wealth of information they possess as a result of their proximity to vulnerable populations. Providing technical support to legislative reforms, etc. These achievements have resulted in reconciling victims with the justice system in their country. Today, with the emergence of civil courts brought about thanks to the division of responsibilities effected by the Act of April 11, 2013, capitalizing on this experience of military justice, which everyone wants, could only increase this sense of civic trust. One point that the DRC particularly stresses is national ownership of all the initiatives mentioned above and their sustainability beyond the temporal mandates of the current actors. It was to this end that the Etats Généraux of the Congolese justice system was established in March 2015. With regard to the fight against impunity, one of the flagship recommendations of this forum encouraged adoption of a national strategy for prosecuting serious crimes. 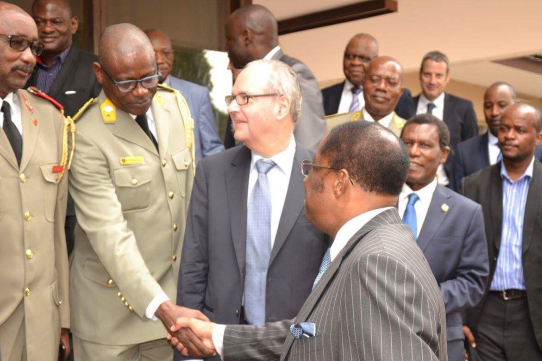 Congolese military justice has taken an important step forward in this process, at the level of certain jurisdictions, with the establishment of a priority list of cases based on transparent and objective criteria. Made available to the hierarchy of military justice, this list is a veritable dashboard that tracks in real time the evolution of legal proceedings at the lower courts. This is how, by awakening the national judicial system from its torpor, the application of the principle of complementarity can gradually lead a state to recover its dignity and sovereignty. This article was originally published on Justice Info. PHOTO: Col. Muntazini shaking hands with DRC Minister of Justice and Human Rights H.E. Mr. Alexis Thambwe Mwamba at ICTJ's Great Lakes Regional Conference.